OneDrive is where you can store files accessible through the cloud as well as share files with other users. Log into Office 365 at https://portal.office.com/ in Internet Explorer. Not all features will work in other internet browsers. Make sure you turn on the Keep me signed in checkbox. Select OneDrive from the menu. After entering OneDrvie go to Library. A windows explorer window will appear and you can copy and move items between OneDrive and your computer freely. Select the files you want to upload and click and drag to the OneDrvie menu. You can also create a folder to organize your OneDrive. To create a folder in click on . You can click and drag files into the folder. 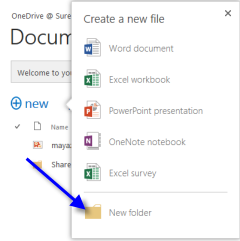 When someone in Office 365 shares a folder or file with you, you will receive an email with a link to the file/folder. Besides this link you can access the shares two different ways. Instead of going to OneDrive go to Newsfeed. Click Edit Links in the left hand menu. Type in a name for the shared filer/folder and copy in the link from the email. Click Ok and Save. A shortcut to the share will now appear in your Newsfeed list. In OneDrive, Newsfeed and other apps you can Search all of Office 365 in a Search Everything bar in the upper left hand corner. Click and type the name of the filer or folder and search. A list of files and folder with the name will appear.